Note that the "golden age" of newspapers was the period from about 1850 to 1890 when the number of papers increased more than four-fold from about 3,000 in 1850 to 13,489 by 1890, which is about the same number of papers as there are today (13,670). HT: Stephen Dubner at the Freakonomics blog. Competition today is much higher and there are far more alternative sources of information. In many ways papers are obsolete. The Wall Street Journal and USA are the biggest national "newspapers". Here is a list of the largest local newspapers which reflect combined print and on-line. New York Daily News is the most popular. Alexander Hamilton's New York Post thrives at #4, as part of Newscorp. I wouldn't say the NY Post is "thriving", it has been losing tens of millions of dollars per year for decades. The only reason it still survives is, according to Murdoch's biographer, because "He's kept the [New York] Post alive because he wants it alive. No one else in News Corporation wants the New York Post alive. Save for Rupert and the people who work at the Post. It just makes no, no economic sense." Aside from such sentimental billionaires, the only reason all these papers don't collapse completely is that the internet guys have so far been too dumb to charge for their content, usually choosing to go after the smaller online ad market instead. Once they start charging, the papers will be dead within a decade, as all the old people, who are the only ones still reading print, slowly die off. Sprewell, if you go to the link I included above, you will see that the NY Post is one of the few top newspapers that is growing in readership. 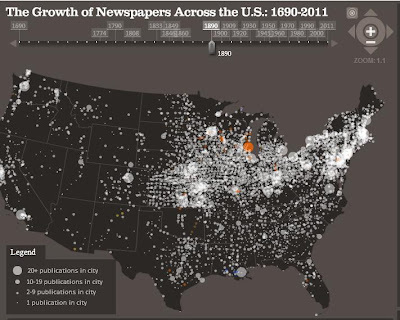 Here are America's newspapers gaining readers (comibined print/on-line). Buddy, what makes you think I didn't? Growing readership means squat if you lose money doing it, which is why I pointed out the large losses they've been taking for years. Most papers depend on profits elsewhere to subsidize their losses. That's not going to last as even News Corp's large and profitable TV and movie businesses increasingly come under fire from the internet, from operations like Netflix that, surprise, surprise, use a subscription model and are starting to bankroll their own content. sprewell has a point buddy. "we lose money on every sale but make up for it in volume" is not much of a recipe for success. the WSJ has one of the few viable models left to newspapers. it's centered around differentiated content. they actually do their own reporting. many (myself included) are willing to pay for that. at a time when most papers are paring back reporting staff and relying on reheated news-wire stories, this leaves the WSJ with unique content that adds value and viewpoint. there is little in most papers you can't grab off of yahoo. those papers are all going to fail.